Rain water, also called precipitation, is a natural feature of the earth's weather system. Air currents in the atmosphere bring evaporated water from the ocean and the earth's surface up into the sky. The evaporated liquid condenses in the cold air, forming moisture-filled rain clouds. Rain water's most well-known and most important effect is providing you with water to drink. 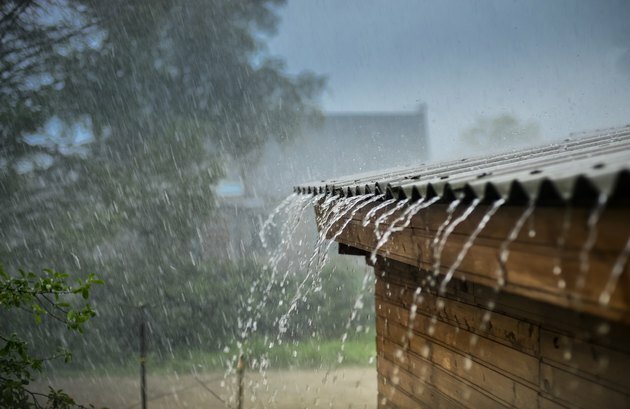 According to the United States Geological Survey, rain water seeps into the ground in a process called infiltration. Some of the water seeps deep beneath the top layers of soil where it fills up the space between subsurface rocks--it becomes ground water, also called the water table. Less than 2 percent of the earth's water is ground water, but it provides 30 percent of our fresh water. Without rain water's continued replenishment of the water table, potable water would become scarcer than it already is. All clouds are composed of water vapor and particles of moisture, according to the USGS. When those droplets make contact with something solid--such as a particle of dust or smoke--they wrap around the particle and grow larger. Droplets can also collide with other droplets, forming a larger particle with increased weight. When the weight of a droplet causes it to fall faster than the updraft current in the air, it becomes precipitation and falls to earth. The USGS reports that it takes millions of droplets to form one drop of rain water. According to the National Climatic Data Center, the wettest place in the world with the highest average amount of yearly rainfall is Lloro, Colombia with a whopping 523.6 inches. The highest-ranked American location is Mt. Waialeale, Hawaii with an average of 460 inches per year. The driest location in the world is also in South America: It's Arica, Chile with an average annual rainfall of .03 inches. Areas that receive heavy rainfall can take advantage of the extra water by harvesting it. Using rainwater for showering, toilet flushing and crop irrigation conserves the public supply of purified potable water. According to the University of Oregon's Center for the Advancement of Sustainable Living, people all over the world harvest rainwater--but despite its practical applications, it's rare in the U.S. Building a catchment system with gutters, downspouts and a storage tank can reduce your dependence on traditional water sources and take advantage of a renewable natural resource. Rain water may play a key role in creating the climates of certain areas. Its very presence in the atmosphere provides for a type of direct evaporation that replenishes the moisture and heat in cloud systems. According to a collaborative study between Cal Tech and the University of Colorado, rainfall evaporation is part of what generates tropical humidity. The study found that between 20 and 50 percent of rainfall in tropical areas evaporates, never reaching the ground. The study used a tropospheric emission spectrometer loaded onto a spacecraft to study water in the atmosphere; participants hope to use the results as a baseline for studying climate change.